What is it about "having a life"- which is to say, about having a sense of separate existence as a subject or self - that is usually taken for granted but is so fragilely maintained in certain patients and, indeed, in most of us at especially difficult times? 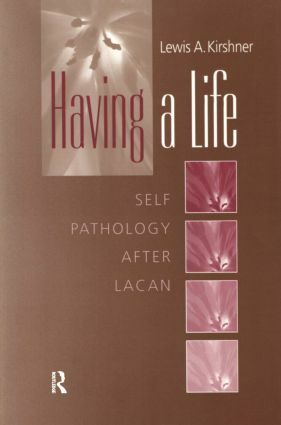 In Having A Life: Self Pathology After Lacan, Lewis Kirshner takes this Lacanian question as the point of departure for a thoughtful meditation on the conceptual problems and clinical manifestations of pathologies of the self. Beginning with the case of Margaret Little, analyzed by D. W. Winnicott, and proceeding to extended case presentations from his own practice, Kirshner weaves together an avowedly American reading of Lacan with the approaches to self pathology of an influential coterie of theorists. By drawing out common threads in their respective discourses on the self, Kirshner achieves an original integration of Lacanian theory with other contemporary approaches to self pathology. Of special note is his ability to sustain a dialogue between Lacan and Kohut, whose shared clinical object, discernible through divergent vocabularies and conceptions, is the struggle of the subject to avoid fragmentation that would obliterate a sense of aliveness and preclude active engagement with the world. Kirshner's opening chapter on the gifted, troubled Margaret Little and his concluding chapter on the eminent political philosopher Louis Althusser, whose self pathology culminated in his strangling of his wife, Hélène Rytman, in 1980, frame a study that is brilliantly successful in bringing "self" issues down to the messy actualities of lived experience. Analytic therapists no less than students of the human sciences will be edified by this cogent, readable attempt to infuse Lacanian concepts with the conceptual rigor and clinical pragmatism of American psychoanalysis and to apply the resulting model of therapeutic action to a fascinating range of case material.